Have you ever made a connection with a bike? It sounds strange, but anyone who has will relate to this. The attraction of a liter superbike is an incredible thing. Sun breaking through clouds on this fine Sunday morning! Its torque and power delivery is something that is hard to describe and can be quite frightening, especially if you're coming from a lesser powered machine. We bought the GSXR 1000 K4 in August 2015. You can find out more about here. We've done everything on this bike apart from taking it down a dirt track. One thing we noticed immediately was that it's an extremely capable machine and it is a bike that left you wanting more after every ride. We never got off the bike wishing it was different. Full satisfaction after riding the Bthou, every time. The Bthou is now sold to make some room in the garage, so we thought we would put together a list of the bike's features and spec. The bike is going to be missed, but times and requirements change! The bike overall was very comfortable and very stable at motorway speeds. We rode the Bthou from London to Turin last year. We did the return journey in one go, 18 hours in the saddle was perfectly bearable with the only problem being fuel range! The bike was brilliant. Basic maintenance is required on models of this age, naturally, like any other machine. Particularly with the K4, kickstand switches, throttle cables, fuel pump strainers are to be looked at if you're buying a used one! 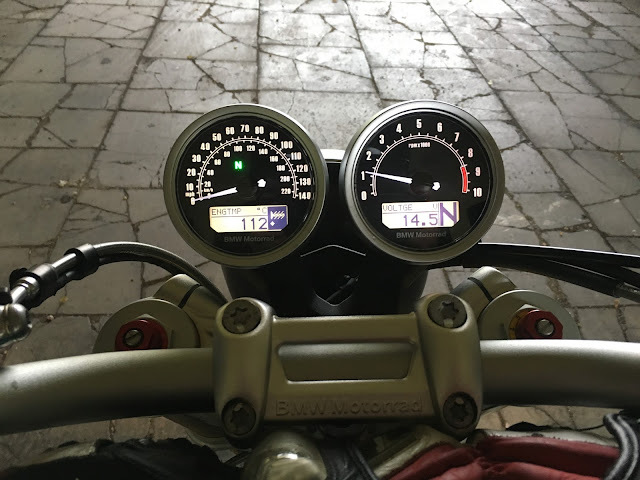 It's all about ensuring that the bike is not going to let you down, not by trying to predict the impossible but by having a look through your owner's manual and service intervals (or Haynes manual if you have one). These checks will give you a good idea about the items that should and can be replaced affordably and easily, before "the bike lets you down" when instead, it's basic user error that is causing the problem! One thing that we will say about the GSXR 1000 K4, and any 150-160+ hp bikes. 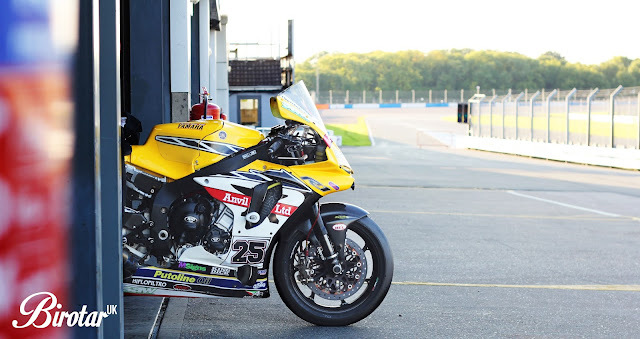 On a track day, you have got to be a seriously experienced and talented rider to be able to use the full bike's power to really stretch its legs and bring it to life. 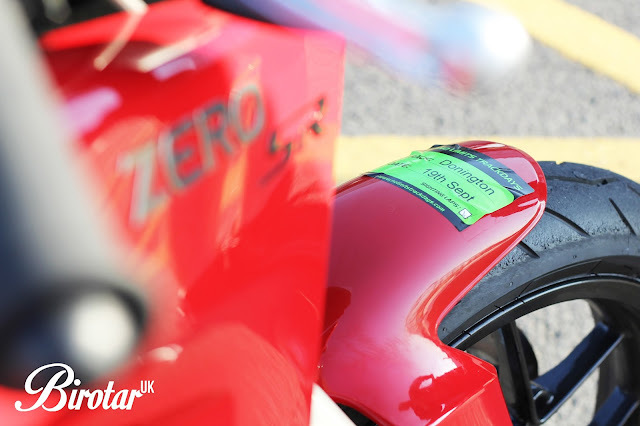 As we experienced at Bedford Autodrome last year, reaching an indicated 188mph on the back straight is easy. Opening up on a straight line is fine. It's understanding when and how to open the throttle on the exit of a corner, using the tyre just before reaching the limit of grip. The reality is though, that it can be ridden gently. It can be ridden slowly, and it's not going to bite you back if you treat it with respect. Arguably, that's the same with any bike. With all the recent bike thefts we were pleased to see the Police in Stevenage enquire about the #Bthou as it was being unloaded from our van. They checked to see if it was stolen when they spotted it in the car park as we were getting ready for a ride. While we continue to take all the possible precautions to prevent theft of our motorcycles, it has definitely increased our confidence in the Police’s efforts. Pirelli invited us to the final round of BSB, hosted at Brands Hatch. With an action-packed weekend of racing, and ‘it all to race for’ in the final showdown, we couldn’t say no. We’ve always watched BSB from the ‘outer circle’ wondering just what goes on in that packed paddock. Pirelli invited us in for an exclusive walk around of areas not usually accessible to the general public. We expected a quick walk around and maybe the chance to get into a team’s garage, but instead, we’d be rubbing shoulders with Fred Clarke as he delivered live commentary. Finally, great to put a face to that infamous voice of BSB Commentary. We then watched free practice from the top of the world, a great experience with an incredible soundtrack. Thinking it couldn’t get any better, we were then taken to the Tyco BMW garage to see how it’s all set up. Certainly a different world from the track day setups we’re used to here at BirotarUK. With team members changing tyres, checking pressures and K-tec suspension experts dialling in the set up that’s being fine-tuned all weekend for optimum performance. There is certainly a few quid being chucked about these garages on a race weekend! Knowing we love the technical aspects of things, and since Pirelli are the tyre supplier for BSB, it was time to see the logistics of tyre delivery to BSB riders. 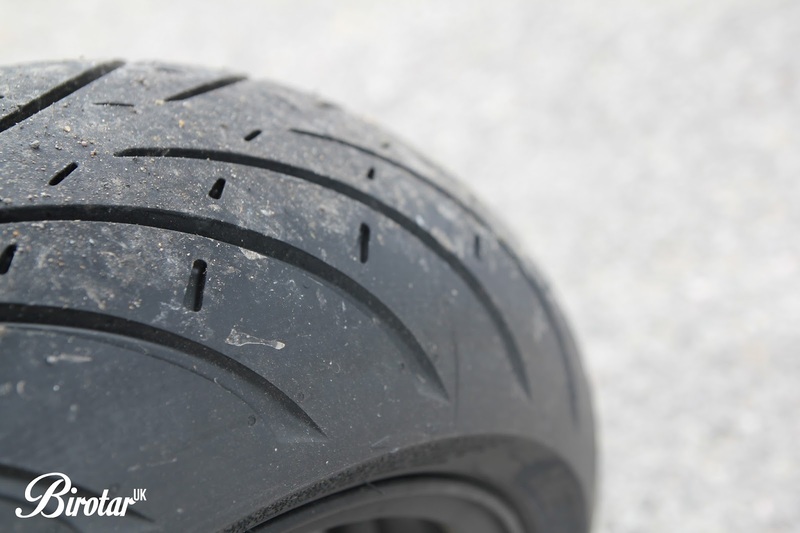 With BSB hosting approximately 200 riders across all classes, Pirelli brings 4000 tyres for the weekend, yes four…THOUSAND. This includes a mixture of slicks, Supercorsas, wet and rain. We managed to catch the tyre fitters at a quiet time but they are usually flat out all weekend. It was great to see what really goes on in the paddock during a BSB race weekend, especially the Final Round here at Brands Hatch. It’s as chaotic as you’d imagine, but controlled seamlessly (most of the time). An amazing experience that we thoroughly enjoyed, we’re now off to catch race one! 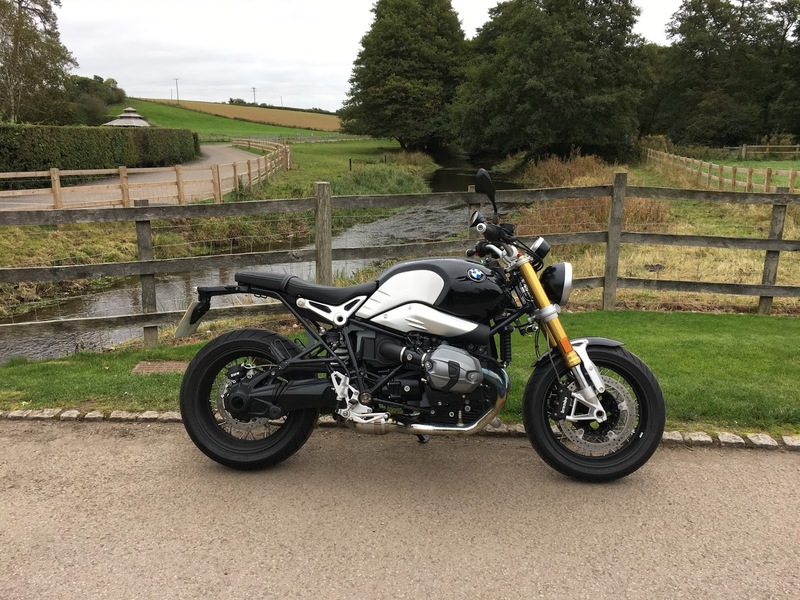 Since the R NineT was released in 2014 (a time when café racers could be found on every corner and coffee was cool again), we’ve often wondered what it would be like to ride and own. We’re all too familiar with the 1200cc air-cooled flat twin, but not in what looked to be an agile and awesome looking bike. On an almost sunny Saturday, we had the opportunity to take this R NineT for a ride and see what it was actually like. We’ll start off by saying that it really is a frisky little number. Almost like that first Tequila shot on a night out, you’re never sure if you want it but once you start you never look back! Or, do you...? Before you’ve put the key in the ignition you’re addressed with classic looking dials coupled with a modern, switchable digital display that shows everything from engine temp to battery voltage. Keys in, dial, sweep, hit the ignition and the bike purrs into life; classic 1200cc boxer sound. 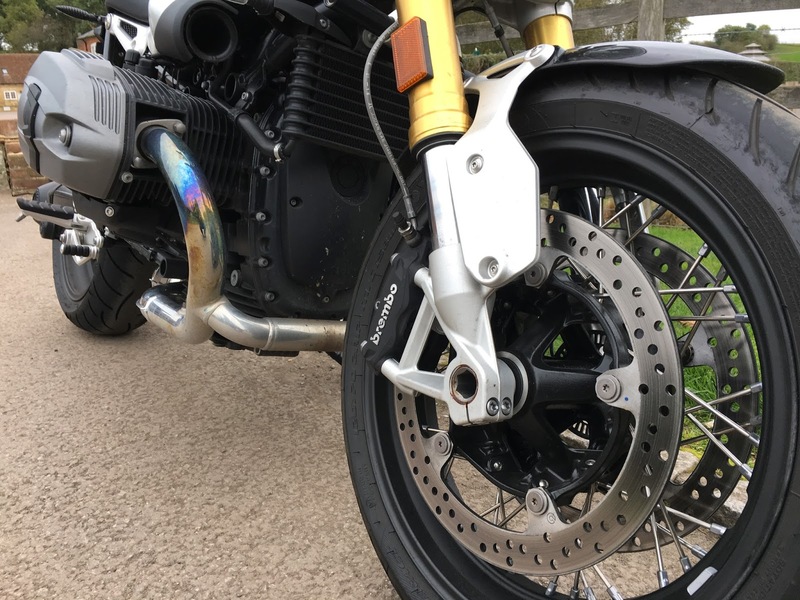 The bike we rode had an Akrapovic end can, giving a beautiful sound in classic Akra style. 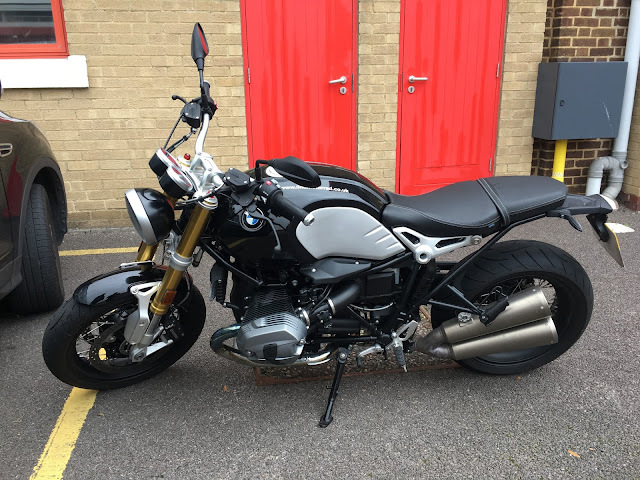 The R NineT has a comfortable riding position, BMW seems to have got the ergonomics just right for us 5ft something’ers. We're not sure a pillion would be comfortable for too long but the option is there. Whilst enjoying some fine country rides, you quickly notice that whilst the ergonomics are comfortable, the ride is quite firm, often feeling a large bump pass right through you. The suspension is adjustable though, so we’d mostly likely soften it up a bit for day-to-day use. With 96hp and 74lb of torque, it’s very easy to make progress on this bike. Most of this torque is delivered low down, making for easy town/city riding. Fourth gear is brilliant, bags of torque encouraging a huge smile as you accelerate out of wide sweeping bends or up the slip road onto the motorway! So what’s it like on the motorway we hear you say...? It’s OK. 70mph is comfortable with no screen, much the same as modern naked bikes without a screen. It wouldn’t be the first choice for a long motorway journey when there’s a R1200GS in the garage. The R NineT is surprisingly smooth, we’re used to this engine in a thumpy R1200GS but BMW has worked their magic and smoothed things out a bit here. Downshift too abruptly and you’ll still get the obligatory sideways wobble that most 1200cc owners are used to. As you’re cruising around, you can’t help but think: 'if we made space for this in the garage for this bike, what would the running costs be?'. Well, with BMWs arguably reliable shaft drive and super reliable engine, regular servicing would keep you on the road. Even valve clearances are no more than an hours work on this engine. On the motorway, we saw just under 60mpg but returned an average of 49mpg in the six hours we had the bike…not bad when you’re having fun! The R NineT runs sensible tyre sizes, a 180/55 rear means you could even run super sticky Supercorsas if that’s your thing. The bike we rode came with Metzeler Roadtec Z8’s and we didn’t have any complaints. Handing the keys back and hopping back on the GS left us wondering if there would be space in the garage for one. Reality is, we’d struggle. Not for lack of room, but it just wouldn’t get used unless it was a sunny Sunday afternoon (or maybe a track-day), an expensive ‘coffee run’ bike, even though it looks SO good. We can understand the appeal though, it looks great, handles well, really moves and sounds amazing, just doesn’t fit our needs…for now anyway. Trackdays. Bizarre events, normally gathering all kinds adrenaline hungry motorcycle riders. Noise, petrol fumes and power ranger suits guaranteed. On the 19th of September, at a damp Donington Park, there was a slight difference though. 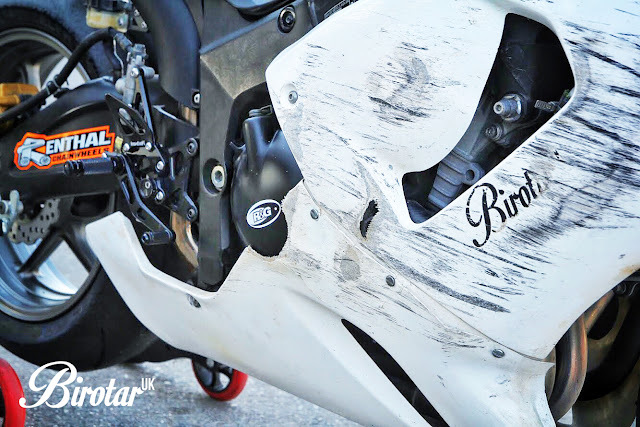 R&G Crash Protection partnered up with NoLimits Trackdays to put on another solid day. They invited the TAG Racing Team for practice and a few of Instagram’s fastest growing UK Motorcycle Influencers in Garage 28. After the track surface dried, both Max & Jonjo started to build the pace after recent track spills put physical and mental walls in place. The R&G Crash Protection fitted to Jonjo's NINJA certainly saved the bike from expensive damage, meaning it could be ridden at Donington without any major mechanical repairs. Donington is an incredible circuit with fast sweeping bends, double apexes and technical hairpins. An awesome place to push your limits and enjoy some 'quality track time', as NoLimits would say. You know that smell of petrol fumes we mentioned? Well, if you were at Donington on the 19th of Sept, you will have noticed that in Garage 28, there was a red piece of electronic wizardry. The ZERO SR. Producing 0 petrol emissions and 0 noise. A fully electric, plug-in, 116ft/lbs rocket ship. Which we tested on the circuit. The review of the SR is coming soon - stay tuned. 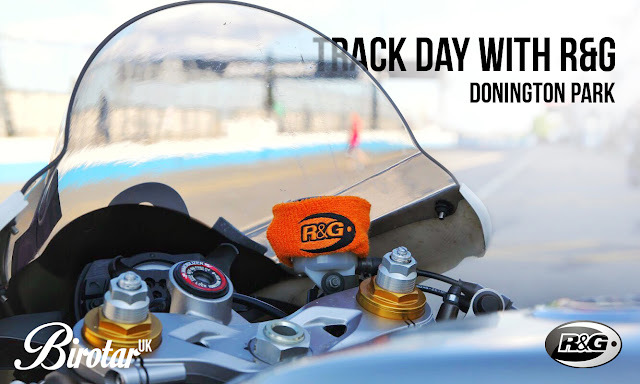 The purpose of R&G’s presence at Donington was to get involved in the track day scene, raise awareness of their product range, and of course provide solutions to anyone who needed some advice for their motorcycle crash protection. If you don’t know about R&G, or would like to find out more, check out our video interview with Alan Garrett, UK Sales Manager from R&G. A huge thank you to R&G for having us at Donington! See you at the next one. Group shot of the Metzeler weekend group! A few months ago Metzeler sent us an email inviting us to a VIP event, with no more information other than a 'please hold the date' - such teases. A few months of back and forth emails trying to tease out some more information the 'final plan' was released a week before the event. So that was Saturday planned, on Sunday they organised an EPIC ride through what was promised to be some fabulous scenery. They also mentioned there would be some other surprises along the way but we'd have to wait to see what these entailed. 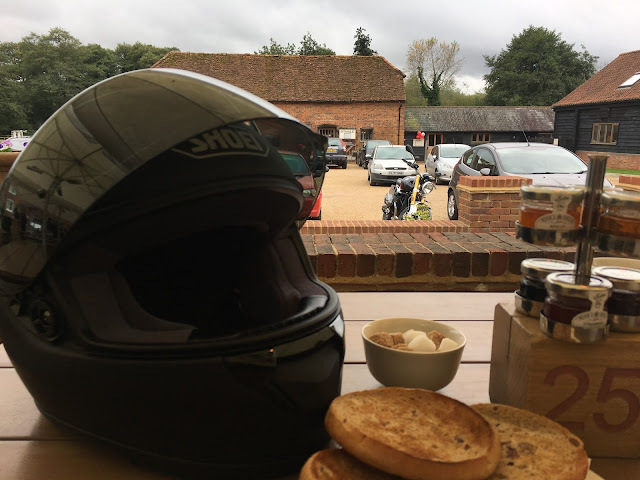 With an alarm ringing at 7AM and a meet-up point set (McDonalds at 8AM) it was time for us to convene for our usual pre-trip B-conference (with breakfast) before our 160-something mile ride to the rendezvous point. The weather forecast wasn’t certain but it did say 40-60% chance of heavy rain, basically it was going to rain, it is the UK after all. A uneventful ‘cruise’ round the M25 and across the M4 saw us approaching Wales. Have you ever crossed the Severn bridge? It’s quite spectacular. 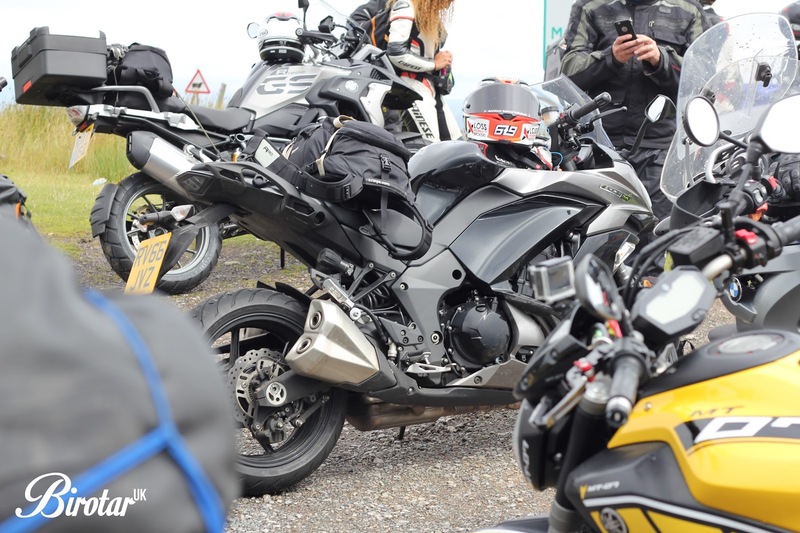 We arrived at the meeting point on time (for a change) to meet Simon, Barry and Jim from Metzeler, shortly after the others from the social media world arrived. Great to finally put some faces to names after months and in some cases years exchanging comments, likes and stories across social media. We had a short ride to the hotel and just enough time to freshen up and prepare for the evening’s entertainment, the FIM Speedway GP held at the Principality stadium – Cardiff. 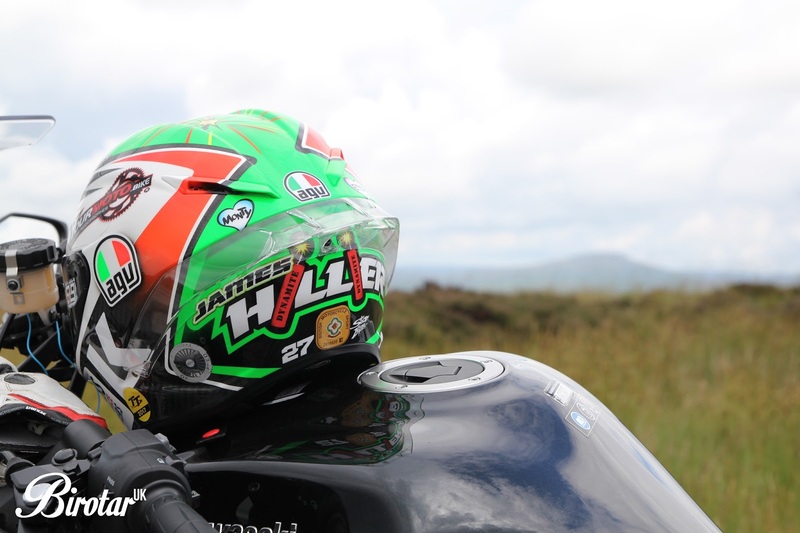 It was at the Hotel Metzeler rider and TT extraordinaire, James Hillier joined the group. Previously our experience of Speedway is about 300 people, a tin shed and some ropey old tractor to re-level the track. Well, we were in for a real treat because the 2016 GP hosted some 60,000 spectators and this year was to be no different. We had a half hour taxi ride with Jim (Metzeler UK Boss) and James to enjoy before the entertainment kicked off. It’s always a bit strange at first... rubbing shoulders (literally) with a professional racer and proclaiming you can’t find the hole (the seat belt – come on now!) but we all got on well. The Streets of Cardiff as we entered the Stadium. The streets of Cardiff were alive with air horns, flags and people having a great time. From that point on the atmosphere was set and it was clear this event was attracting a huge crowd. Earlier on we mentioned Metzeler would provide all the trimmings, here we found out that meant a VIP package including drinks and a three course meal, nice! Pleasantries out the way it was time to take our seats with a great view of the whole circuit, in particular we were sat on the start/finish line. The build-up was incredible – fireworks, fire, flames, fire breathers, music, you get the idea. It was a show before the show. If you’ve not seen Speedway before it’s basically four people on motorbikes with no brakes that race/drift around an oval circuit. It’s so simple yet so addictive, the skill needed to hustle these lightweight machines around is incredible. The smell, is something that will stick in your memory. The 500cc single gear bikes run on pure methanol and vegetable based oil, the smell is addictive, as is the noise! The format of the Speedway means you get a good couple of hours racing. Sixteen riders take part in each Grand Prix and over the course of twenty heats each rider will race against every other rider once. The top eight scorers advance to a semi-final and from each semi-final the 1st and 2nd placed riders will advance to the GP final. The evening concluded with a huge firework show, the crowd had been fully immersed from start to finish. After a few (more) beers it was time to head back to the hotel. Once again we were with Jim and James, now this taxi ride is something we really wish we could have got on camera although we don’t think it’s something we could have gone live with…pure comedy, a reminder that even the most professional of riders/businessmen are just normal (and very funny) people. If you ever get to meet James, ask him if there’s a McDonalds in the Punjab, guaranteed it’ll bring a smile. The FUNNIEST can journey with our Punjabi cab driver. "Is there a McDonalds in Pakistan?" To conclude Saturday we all shared a drink or two at the hotel before calling it a night at some time past midnight. Metzeler had put us up in a very nice hotel and it would be rude not to take advantage of this, with the alarms ringing early and being told we had to be ready to ride at 10am we made sure we had enough time for a morning swim and sauna, got to keep fit and healthy, right? Not wanting to be too healthy we enjoyed a nice cooked breakfast knowing the weather wasn’t going to be on our side today. With everyone suited up and ready to ride the heavy rain continued, no problem though we’re used to riding in any weather. To follow was some amazing Welsh roads with stunning views. The rain had eased off by now to all but a drizzle so we all stopped off for an ice cream and to enjoy the views. 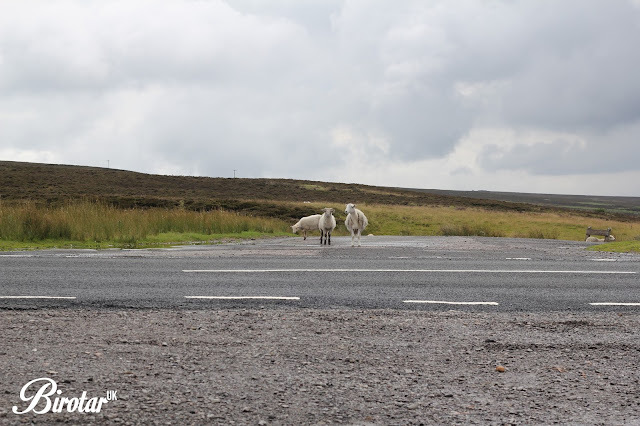 It was at this point we managed to get a few words from James on camera after the wild sheep had stopped playing chicken with the passing cars! Ice creams finished, interview done it was time to head back into the valleys and enjoy more of what Wales could offer. We enjoyed a good couple hours of wide open roads to tight woodland twistys, but then the Bthou started playing up, cue loss of power, cutting ignition and generally being a pain. Initially it looked like an electrical problem so we taped up some connections under the seat and the bike seemed fine again, good because it was a long way home! We finished the ride for the day around 2pm, we all stopped for a drink and chin wag before packing up to head home as yet again the rain clouds rolled in. From where we stopped it was about 170 mile ride home, James joined us for part of the journey and for the first and only time we can say we were ahead of a TT rider on the open road! On the way back we had torrential rain and hail, yes hail, in July. We managed to get our heads down and power on though making some good progress through the traffic. Bthou playing silly buggers and the GS coming to the rescue! Anyway, we made it home safe and sound in the end after what was an amazing weekend. Being side-by-side with tyre industry professionals and world class racer James Hillier opened our eyes to the true science that goes into tyre production and development. We're not experts because of it but we've certainly discovered that the knowledge and experience in Metzeler/Pirelli is what makes their tyres market leaders. 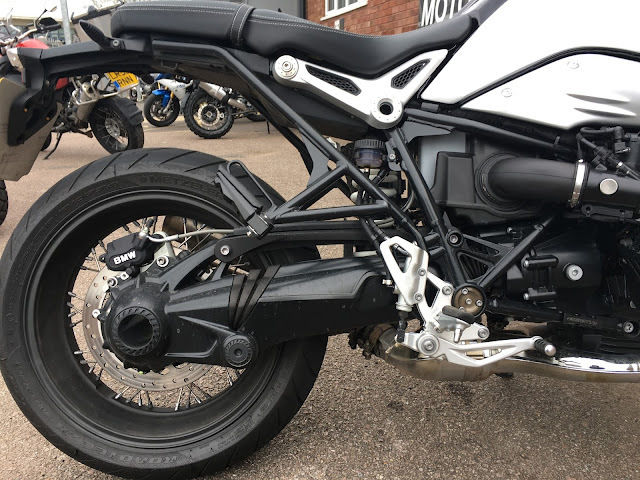 We highly recommend you take the time to find out more about Metzeler & Pirelli tyres when you're next due to change your tyres. You will not be disappointed! And if you have any questions, don't hesitate to get in touch with us - we'd be happy to help. We’d like to thank Metzeler for inviting us, providing the hospitality, guiding us around some amazing roads and providing some great laughs along the way! All text, image, video and other content is ©BirotarUK. Simple theme. Powered by Blogger.